Flores is a town in Petén, Guatemala. The town proper is an island on Lago Petén Itzá, connected to land by a causeway, on the other side of which lie the twin towns Santa Elena and San Benito. All three are often referred to as Flores, and are grouped in one article here accordingly. For many, the main reason to visit Flores is its proximity to Tikal, the most famous Maya ruins in Guatemala, or as a starting point for trips around Petén. It is located approximately one hour by bus from Tikal. But the city itself is a wonder — dense with colonial, red-roofed buildings, narrow cobblestone streets, a historic church and Spanish plaza, and restaurants that are easy to stumble upon walking the city's charming streets. Most will find that this island city is more than just a take-off point, but a memorable attraction in itself. Flores is a quiet and peaceful place, and probably one of the safest places in the sometimes wild north. Santa Elena and San Benito require a little more caution, but offer a more authentic experience of a Guatemalan town, complete with traffic, litter and street food. Mundo Maya International Airport (IATA: FRS) is just outside Flores and is the only other international airport in the country aside from Guatemala City. This modern facility with its 10,000 ft. runway is courtesy of the US CIA. TAG and TACA Airlines  both run daily flights from Guatemala City, but are often delayed in both directions. Tropic Air  also offers an inexpensive option from Belize City in a light aircraft which, if you're lucky, flies low providing amazing views of the rainforest. They have daily flights from Philip Goldson International Airport to Flores at 8:30AM and 3PM, with return flights at 9:45AM and 4:15PM. TACA used to fly from Cancun, however the flights were discontinued in 2011 and it is unclear when they will be resumed. A taxi from the airport to Flores island costs Q20 (or Q10 per person, whichever is larger). It is about two kilometers from the airport to the Flores causeway. Tuk tuks (three-wheeled motorcycle taxis) can be found along the main road outside the airport and throughout the town, for Q5 per person. Minibus shuttles to Tikal or El Remate can be found just outside the arrival area near airport parking. Mayan Heart World  also offers an inexpensive option from San Ignacio Town, Belize your drive is able to privately transfer you to and from Flores via ground transfer. Travel between Flores and Tikal made easy with this company, as the have daily shuttle to and from either destination. Buses from Guatemala City and Belize City as well as various other destinations all over the country stop at the Fuente del Norte bus station in Santa Elena, a five minute auto-rickshaw ride across the causeway from Flores island (Q5). There are direct tourist buses you can book direct from Semuc Champay/Lankin for 125Q - Sept 2016. These take between 8 and 10 hours - door to door service. Autobuses del Norte (ADN), 8a Avenida 16-41 Zona 1, Guatemala, ☎ 2251-0610 | 2251-0079 | 2251-0050, . edit New First Class (express) buses for Q180, leave Guatemala City at 10PM - on Fridays and Sundays, there's also a bus at 9PM. The final stop is Santa Elena, but the bus will go to Flores to drop passengers who wish to stay there. These are comfortable buses, and the price includes a drink and a snack. The seats are two across on the left and solo on the right. Try to get a seat to the back, as you will be far from the driver's and assistent's talk. Keep in mind that the seats have different spacing for the legs, so it's worth asking to check the bus before choosing your seat. Linea Dorada, ☎ 7767-5198, . edit Runs first class buses leaving Guatemala City at 9PM for US$30,"first class" buses at 6.30am, 11am and 8pm for 190Q (US$24) and an economy bus leaving at 10PM for US$16. Get your tickets from the official office, as the touts will sell you crappy seats in the back row for double the money and leave you wondering why all the other passengers get drinks and food, there is no food or drinks in the economy and first class buses, they make several stops along the way, and usually arrive with an hour or two delay. Fuente del Norte, . edit Has 15+ departures from Guatemala City per day. Most of these are local runs with second-class buses (older pullman coaches without air conditioning), but they also operate a few first-class express buses (with toilets and air conditioning) leaving from Guatemala City at 10AM, 2PM, and 10:30PM, and a deluxe bus leaving from Guatemala City at 9PM. Tickets range from Q110 for a second-class bus to Q160 for a first-class bus to Q200 for the best seats on the luxury bus. Get one of the downstairs "camitas" and bring either a sweater or blanket if you are going overnight. From Cobán (travel time: 5 to 7 hours), there are a few through Fuente Del Norte local buses, or you can use the frequent public microbuses (colectivos) that operate along the highway between Coban and Santa Elena. If you choose the microbus option (total fare: Q70) you will have to change to another microbus at Sayaxché after you take a quick boat or maybe the ferry across a river. The colectivo option may actually be quicker, because if there is a backup for the ferry, you can quickly pay a couple Quetzals for a boat ride across. There are also tourists shuttles offering direct door-to-door service from Flores to Cobán for around Q100. The road from Cobán is very scenic; it's a smooth paved ride all the way (though windy for about an hour out of Coban). If you're coming from Lanquin, Aventuras Turisticas has a shuttle for 85Q (August 2015) that will drop you in the center of Flores in about 8 hours. You can find them on the road out of the center right before El Retiro. Chances are you can book this same shuttle bus at your hostel for a slightly higher price. Don't believe them if they tell you they have air conditioning. There are tourist shuttle buses from the Belize City water taxi terminal to Santa Elena: Linea Dorada  at 9:30AM or San Juan Express at 9:30AM and 2:30PM, US$15-US$20, travel time: 5 hours. Note that these buses do not make any stops in Belize; if you are travelling from San Ignacio or Belmopan, you must use the option below. Take a local Belize bus (novelo) to Benque Veijo (3 km from the border), which costs BZ$10 or BZ$11 for express. Then take a shared taxi to the border (BZ$3), walk across, and continue to the Melchor de Mencos bus station (less than 1 km from the border), where there are frequent microbuses (30Q) and the occasional pullman coach to Santa Elena. Approximately US$12; travel time: 2 hours. From Chetumal (Dec 14): San Juan offers a shuttle service in a minivan for 450M$ which leaves the ADO busstation at 7:00AM. 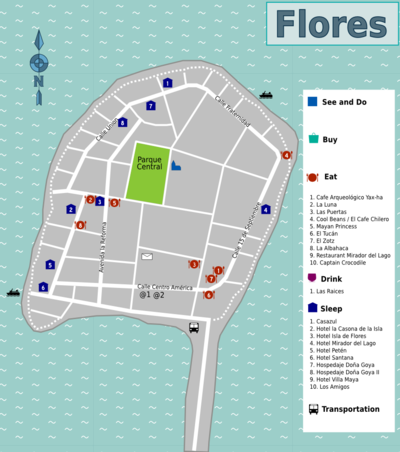 It arrives in Flores between 3 and 4 PM and you will be dropped off at your hotel in Flores. Your luggage will be carried on top. You pay 360M$ exit fee for Mexico and 30 US$ for Belize. You will walk through the borders of Mexico, Belize and Guatemala, taking all your luggage off at the Belizean border for inspection. There is also a direct bus from Honduras and El Salvador. See the "Get Out" section below for details on travel to Palenque in Mexico. If you are staying in Lanquin, many places to stay offer direct shuttle for around 150 quetzales and the trip takes around 8 hours. The shuttle will likely leave you where you want on Flores, but it is better to ask before to make sure they won't leave you in front of their office, for example. Book a riverboat to La Tecnica or Bethel from one of the two hotels in Frontera Corazol: Escudo Jaguar, or the less expensive, Nueva Alianza. Go straight to the Frontera Corazol dock to negotiate a river crossing directly. Because river-crossings are typically organised through the hotels, it can't be guaranteed that boat drivers will be ready and waiting if you choose to go directly to the dock. La Tecnica is only slightly upriver from Frontera Corazol and should cost ~ 50 pesos. Bethel is some way downriver and will cost closer to 400 pesos. These prices are based on relatively recent travel blogs. People will be able to exchange pesos and USD for quetzales at the docks in both La Tecnica and Bethel at very reasonable rates. Buses leave La Tecnica for Flores hourly until 2pm and cost 70Q as of Dec, 2015. 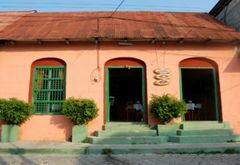 If leaving from Palenque, begin your journey early to ensure you have enough time to get on a bus at La Tecnica. Tickets can be bought just up the road from the dock. The bus trip to Flores takes ~ 5 hours. The bus will stop at the Bethel immigration office. You will be required to have your passport stamped and pay a fake 40Q (100 pesos) exit fee. People have tried talking their way out of this fee with varying degrees of success. Walking is the most common way to get around, and circling the whole island takes about 15 minutes. It is an easy walk to Santa Elena and San Benito from Flores. Otherwise, auto-rickshaws, vans and buses are an option. The standard fee for an auto-rickshaw in the Flores/Santa Elena/San Benito area is Q5, but if you have a lot of luggage or squeeze in two people, the fare is 10. The towns of San José and San Andrés, located on the northern shores of the lake, can be reached by hiring an expensive boat. The once-regular passenger boat service has been reduced following the improvement of the road - it's now easier to take the regular van or bus service there from the Santa Elena market, which costs Q7 and takes around 30 minutes. These buses leave when they are full, and will be packed to capacity and often beyond! A chicken bus goes once an hour; these are more comfortable and slightly cheaper at Q6, but take longer. There are regular boats to San Miguel (Q4), a small village directly north of Flores. There is a gap between hotels east of Hotel Doña Luisa at the most northern part of the island. Boats are moored behind Hotel Santana, and run to Petencito Zoo and are available for lake tours. Prices are not fixed, and haggling with the boatmen is a must. You can also get souvenirs in the shops in Flores, but the prices and selection are better elsewhere in the country, so only worth checking out if this is your only stop in Guatemala. Two ATMs in Flores next to Hotel Petén and at the supermarket "Fotomart" at Calle 30 de junio allow cash withdraws from Visa cards. More ATMs can be found at the airport, as well as across the street from the airport. They support Mastercard as well as Maestro cards. Cross the street towards the Maxi Bodega supermarket and enter the mall left of the supermarket entrance. The ATM is a few meters down on the right side. There is an ATM in the supermarket on the ground floor of the Mundo Maya International mall. This is located just across the causeway from Flores, on the Santa Elena side. It had Visa, MasterCard and Cirrus signs. The mall is very secure with numerous guards etc and is a great place to buy cheaper food and snacks than on the island of Flores itself. There were three other banks here too including Banco Antigua and Ban Rurale. Wild animals are a common item on the menus in Petén. However, many of these species are killed illegally, so consuming them is detrimental to to the local ecology. Every day around 16:00 street vendors start setting up on the West side of the Island. They have all kinds of food, dessert, and drinks, and should be consumed with disregard to utensils and while enjoying the lake. There is also a small market on the island itself on Calle 15 de Septiembre were local women sell tortillas and the like for 5Q per portion. They are there daily from 2 P.M. until 10 P.M. and also have tasty beverages. The locals eat 2 or 3 portions as a cheap dinner alternative. There's a supermarket on Calle 30 de Junio opposite Hotel Petén that is open 24hrs, and a large grocery store "La Torre" in the new mall just across the causeway towards Santa Elena. If you're on a budget, try the local shops further in Santa Elena. Almost all travelers will stay on the island of Flores, but there are a couple options in Santa Elena and San Benito if for some reason that strikes your fancy. Tikal.net and Peten.net, Calle Centro America. 8AM-10PM. Both can transfer photos from digital cameras to CD and charge Q8/hour. Altobuses del Norte (ADN), Terminal de Buses Santa Elena, ☎ 7924-8131 | 7924-8151, . edit Has departures from Flores at 10PM (Q200 - Dec. 2010). The bus leaves from Santa Elena. Contrary to previous reports, this bus does NOT go to Flores. A taxi to the bus terminal in Santa Elena should cost you no more then 35Q. Very comfortable seating and excellent service. All the locals use Altobuses del Norte or any of the other bus companies leaving from the Santa Elena bus terminal. Linea Dorada, ☎ 7767-5198, . edit Has three departures from Flores, at 9PM (Q190), 10AM and 9:30PM (Q150). This buses also pick up the passengers in Flores, in the same place as ADN. Tikal - this park is a major attraction in Guatemala, and is located 60 km from Flores. Open: 6AM-6PM (after 3PM arrivals gain free re-entry the following day). Admission: Q150. To avoid crowds and experience the rich wild-life at its best try to arrive around 6-7AM. Belize City - Bus companies San Juan, Maya del Oro and Fuente del Norte operate minibuses for ~Q180, which start around 5 a.m. (although you often won't leave Flores before 6 a.m.). You will reach Belize City at ~ 11 a.m. Most people continue by water taxi to the nearby islands (prebooking is possible in Flores, but not necessary). Alternately you can get a chicken bus/collectivo from the terminal in Santa Elena to the border (Just ask for the chicken bus to Melchor De Mencos - 2hrs, Q30 - Dec 2015), take a short (<5mins) walk across the border, get a taxi or walk to the bus station 2km away (taxi B$10 - Dec 2015) and then hop on a local bus to Belize City (3.5hrs, B$9 - Dec 2015). Total travel time around 7hrs including waiting for buses and immigration etc, the first buses leave Santa Elena early (5am) so you can easily make it to the Islands in one day. There are only chicken buses to Chetumal (only very few on Sundays), which take 4-6 hours. El Remate – A small village located 30 km from Flores with a nice, calm and rural atmosphere, and normally less crowded than other places in the area, making it a nice alternative base for those exploring Tikal and the region. All minibuses from St. Elena to Tikal ($1) stop here. However, some large buses ($0.30) only stop at a crossing 7 km from El Remate, so ask first. Taxis are available for US$20 from the airport/Flores. Motul de San José - a small Mayan site just north of San José. Buses, minivans and hired boats operate to the site. The ruin has a few stelae with visible glyphs and a number of vegetation covered mounds. Ixlú is a small Mayan site near the Melchor de Mencos junction on the way to Tikal. It is only of interest to the die-hard fans of Mayan sites. El Peru, AKA Waká, AKA the formerly elusive Site Q, can be seen on a three day trip from Flores. Holtún is a small archaeological site 60 km from Flores on the way to Melchor de Mencos and the Belizean border. A broad, but unmarked path leads to the site. Locals can give directions. The site contains tree and vegetation covered temples. Painted masks adorn the inside of one of the temples, but this part is off limits to tourists (unless you can get a permit from the guard in charge). The part open to tourists also has masks, but these are not as impressive. El Mirador - Flores is the base for tours to the site of the largest Mayan temples, El Tigre and La Danta. This archaeological site deep in the rain forest near the Mexican border is of huge significance and can only be reached by foot and mule train - a five day round trip trek. Expect to pay $150-500 (shop around) for the entire package including guide, food, mules and transport to Carmelita, the starting point for see a description of tour look http://adrenalinatours.com/hikes-treks/grand-route/el-mirador.html . An extra day allows further travel along much of an ancient raised causeway to the ruins at Nakbé, which is around 3.5 hours away and 5 km closer to Carmelita. Any agency in Flores or Santa Elena can arrange tours to these places. Yaxhá is a archaeological site 73 km from Flores on the way to Melchor de Mencos and the Belizean border. 62 km from Flores, just after Holtún, turn off on to the dirt road to Yaxhá (11 km). The site is not as popular as Tikal, but is well worth the trip. In addition, you may find that you are the only visitor, which offers a very different kind of experience from that of wading through the crowds at Tikal. There is ongoing restoration work at the site. As of February 2007, for foreigners there is an entrance fee. Q80 per person. This fee covers Yaxha, Naranjo, and Nakum. The sites are very far apart and without a vehicle, impossible to do in one day. Topoxté is a small site on an island on the west shore of Lago de Yaxhá. It can be reached by lancha (boat), costing around Q100 for the 15 minute journey. Nakum is an impressive site some 20 km north of Yaxhá. From here it is a one day walk to Tikal, but you will need a guide. This site is undergoing extensive reconstruction and has an acropolis that is larger than that of Tikal. You can get there in the dry season with a 4 wheel vehicle. To get here, you will need to pay the entry fee at Yaxha. El Parque Natural Ixpanpajul - a 10 minutes drive from Flores, which has a canopy tour, a walking loop with suspension bridges and, in addition, offers horse riding and camping facilities. The organisation offers free transportation service for more than 2 or 3 persons. Take the 5AM Pinata bus from the Santa Elena bus terminal to La Técnica - the last stop past Bethel. It takes approximately four hours. The last couple are on an unpaved but beautiful road - just be glad you're in the bus and not in a minivan! They'll stop at the immigration checkpoint for you, and this is the last time you can change your Quetzals into Pesos. There's then a five minute boat journey across the river to Frontera Corozal. It should cost 15Q (Locals) but you'll end up paying 20Q! There will then be comfortable combi vans waiting on the far bank to take you to Palenque. You can leave your bags in the combi and go on to immigration. It's up the bank, follow the road around to the right then straight on for about 100 metres and immigration is on your left. Neighboring towns - Don't forget that aside from Flores and Tikal, there is more to see and do around Lake Peten Itza, particularly the locals in some quaint neighboring towns. On the north shore of the lake, just across from Flores are San Andrés and San José. These two lovely little towns boast a similar architecture to that of Flores but set on the side of very steep terrain, which makes for quite a dramatic street stroll with beautiful views of the lake. The people of both towns are very lovely, polite and helpful. Why not come across and have a chat with the locals to practice your Spanish? And if this is out of your lingual reach, you could take intenstive Spanish classes in either town along with culturally enriching home-stays. To get there, just head to the bus terminal in Santa Elena (10 minutes on foot) and wait for one of the very frequent local buses (colectivos). Local buses to and from run between 6AM and 5PM, ask at the station for which one to take. Also make sure to ask when the last return bus leaves if you only plan on going or the day! The towns are small so buses run on fixed schedules and relatively infrequently, unlike in the larger cities of the south. Fares will be 6-13Q depending on which town you're going to. While Flores is one of the safest parts of Guatemala, petty theft is still fairly common. Also, there are many incidents of conning and false advertising that go on in the tourism industry. Certain guides have been known to ask for the money upfront, then disappear. Others will ask you to pay upfront and then give you a tour that falls spectacularly short of what was advertised. Another frequent problem is guides who do jungle tours but don't bring adequate equipment or supplies, causing their guests to endure hunger, thirst, exhaustion and sometimes physical harm because of their negligence. Pay the guide after the tour, not before, as they may be trying to pull one of these stunts. Please note a local with a scar on his face (he's known in the area as scarface) often goes onto buses just before they arrive into Flores, do not buy tickets from him as they are often fake tickets for companies that are not in service anymore. Be wary when travelling into Flores from Belize City with Mundo Maya bus company. A small minivan will pick you up from the bus terminal, take you to an atm and then into drop you outside their office in Flores. Do not book any tours or bus tickets with this company as they will charge you double the fair price. This page was last edited on 20 April 2019, at 23:59.